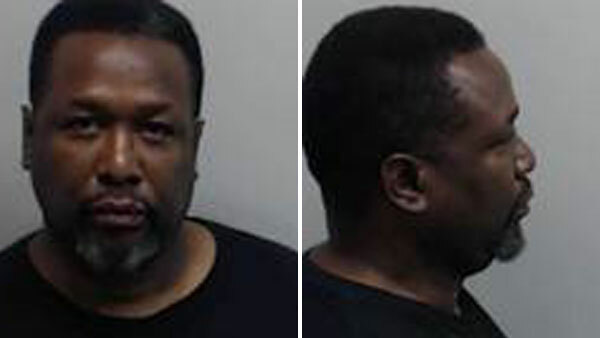 ATLANTA -- A discussion about politics upset actor Wendell Pierce so much that he followed a group of people to their hotel room, tried to force his way inside, hit a woman in the head and ripped the hood off of her hoodie, she told Atlanta police in a report released Monday. Pierce acknowledged following the group to their room after the political discussion, but told police he was standing outside when the woman and two of her friends tried to pull him inside as he tried to get away. Pierce was charged with simple battery and released on $1,000 bond, Fulton County Jail records show. No charges were filed against the woman and her two friends. Pierce, a New Orleans native, is known for his TV roles as Detective William "Bunk" Moreland on "The Wire" and Antoine Batiste on "Treme." Jail records list his current address as Pasadena, California. The records don't indicate if he has a lawyer to speak on his behalf. The woman and two witnesses listed in the police report didn't immediately respond to phone messages Monday from The Associated Press. The police report doesn't specify the nature of the political argument, but said the woman and her two friends were sitting in a hotel hallway when Pierce and his girlfriend exited the elevator. "Both groups of parties began a conversation about politics, which got Mr. Pierce upset," the report states. The woman police identify as the victim in the case told officers that Pierce began to push her, and she and her friends then began to walk to their room. Pierce acknowledges in the report that he followed them to their room, but disputes what happened next. Pierce and the woman both declined medical help, but police said they took photographs of both people's injuries. Throughout the process of being arrested, Pierce never indicated he was well-known and his arrest was treated like any other, Atlanta police spokesman Donald Hannah said. Following the arrest, Pierce decided not to attend and speak at an upcoming graduation ceremony in New Jersey. Pierce did not want to create a distraction, Rutgers University-Newark announced Monday. TV news anchor Soledad O'Brien will speak at Wednesday's commencement instead, school officials said.